Sacrifice Bunting With A Big Lead? There were many scenes like this one at the BC-Clemson game, but the Eagles didn't take their big lead for granted. It is rare that you see a team sacrificing with an 8-run lead, but that is exactly what the Boston College Eagles did on Friday in their game against Clemson (ranked #20 in the country). In fact, they attempted to do it on two occasions. In the bottom of the 4th up 8-0, DH Matt Hamlet advanced Robbie Anston to 2nd base with a sacrifice bunt. With the same score in the bottom of the 6th inning, the Eagles tried it again (this time with a runner on 2nd base with 0 outs). Was this unconventional? Was it a sign of respect for the Clemson Tigers? Should teams with big leads take this approach more often? In this game, I think we had a case of a coach understanding that a team like Clemson could put up a lot of runs in a hurry. By bunting, BC Coach Mik Aoki sent a message to his kids that there was a lot of game left to be played and they still needed to fight for every run. It was even more important to send the message in this game seeing that 7 of their 8 runs had been scored on homeruns and the fact that it was the first game of a three game set. Losing a lead like that in game 1 could have been a devastating momentum shift. Rest assured Eagles fans…BC extended its lead and rolled to a 13-1 win. I’d like to see more coaches manage in this fashion. Don’t think just because you put up some crooked numbers early in the game that it will happen again. Play for one. Those insurance runs can really drain the opposition emotionally. Do you agree? BaseballThink is partnering with the Boston Amateur Baseball Network, New England’s top resource for adult baseball, to provide them with baseball tips and strategy from local amateur ballplayers. From time to time, you will find our content displayed on the network’s website-bostonbaseball.com. The site is the most comprehensive resource for New England adult baseball and also provides general baseball information useful for ballplayers of all ages. BaseballThink correspondent Jim Storer visited Louisville Slugger last week as part of the Innovator’s Road Trip. We had a great “behind the ropes” tour with Rick Redman, the VP of Customer Communications at Louisville Slugger. It makes the most sense to start this post where our tour ended, in the Slugger Museum. Inside the front door there’s a butter churn.. huh, what’s that got to do with baseball bats? Well, that’s what we asked and here’s what Rick told us. We found this to be an amazing story that really highlighted what we’d been hearing throughout the Innovators Road Trip – innovation usually comes from improving or building something based on a product that already exists. In the early days of baseball (and still today), players would try anything to get a little edge. Rick told us a story about how players traveling in the area playing games would often sneak out of the hotel early in the morning and wait outside the Slugger factory so they could get in first (and get the best wood) when they opened the doors. Talk about competition! Early on the company hand-turned all of the bats they made on a lathe. This relatively time consuming process limited their production capacity, but the personal attention they gave each player helped them build a strong brand that’s kept them in business for 125 years! During our tour, Rick introduced us to Tom, who had been working in the factory for 39 years. He’s currently working on MLB player bats (all done with a computerized lathe), but he started out hand turning bats on a lathe and offered to show us how it’s done. Check out the video. Now take a look at how long it takes to produce the same bat with today’s technology. Making a major league bat takes even more precision. Slugger has one machine that they use to produce bats for MLB players. 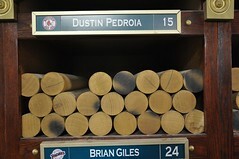 It cost them $1M and uses a computer to store all of the individual players specific characteristics and make bats to match.